This won’t be Bill McDorman’s first visit to Colorado Springs, and if his past appearances are any indication, he is sure to be well received! 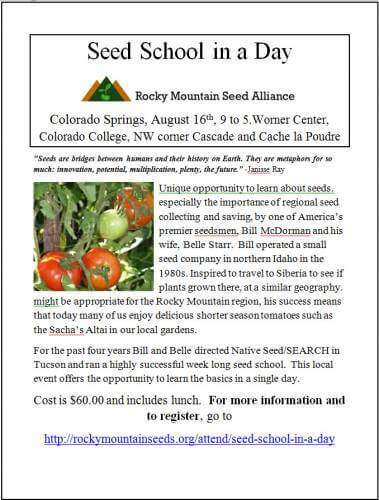 The following article (written by Candace Krebs and previously published in the AG JOURNAL) describes his presentation at Colorado College back in 2010 and gives a little more detail about the importance of seed preservation and its history in Colorado. In seeds lie the seeds of human civilization. Saving and replanting seed from the previous year’s planting is a way to “rejoin a 10,000 year-old ritual, the ritual responsible for civilization,” Bill McDorman says. After World War II and the introduction of hybridization, it became harder to replant seed since crosses yield inconsistent results, and, in some cases, plant variety protection and licensing agreements limit or prohibit the practice. But while seed saving is nearly gone with the wind, McDorman is an evangelist on a mission to bring it back. McDorman recently gave a lecture at Colorado College where students and gardening enthusiasts gave him what he called a “rock star” reception. “They all gardened, and they all saved their own seeds,” he says. Heirloom seeds he collected from farmers in those remote villages went on to win blind taste-testing awards and to be featured by Martha Stewart. Researchers have documented as many as 3,000 to 5,000 different food plants that were used by the Native Americans. Since then, an enormous number of local and regional plants have simply disappeared. “This isn’t just Irish potato famine talk,” he added, referring to massive starvation that resulted in Europe in the mid-1980s when potato blight wiped out the tuber, a staple of the poor and working class. More recent challenges include the emergence of so-called Ug99 stem rust in wheat, a virulent fungus which McDorman noted “is on the march” across Africa, Asia and the Middle East. McDorman also expressed concern over a 32 percent increase in one year in the price of seed corn, which he said was “huge for farmers that are stretched already.” Fears that so-called terminator genes, which render a plant sterile, could drift and get into other plants have been mollified by Monsanto’s promise not to introduce the technology. But the potential for cross-pollination of genetically modified and conventional crops is another pressing issue, he said. If genetically modified alfalfa is federally approved, “the organic dairy industry, as we know it, will cease to exist,” he said. Alfalfa is an insect-pollinated crop. Corn is pollinated by the wind. As a result, it is nearly impossible to prevent cross-contamination of genetically modified material, he said. A coordinated effort in Europe to create a “white list” to shutdown seed exchanges and ban medicinal plants to prevent the introduction of invasive species has already reduced plant diversity on that continent by more than half, he added. McDorman is an advocate of seed banks, which preserve rare genetics, and seed libraries, which distribute seed on the condition that the farmer brings back more of it the following year. He suggested such ventures could be started small on the local level by holding “seed trader potlucks.” Instead of exchanging recipes, participants could exchange seeds, he said. He acknowledged Colorado’s rich history in the seed business, noting that Vic Hollar Seeds of Rocky Ford is a world leader in wet-process seed saving of fruits like melons. He also pointed out that one of the largest gene banks in the world is located in Ft. Collins – the Ag Research Service’s National Center for Genetic Resources Preservation, which contains more than 5,000 samples of gene materials from plants and livestock. There are about 1,300 gene banks worldwide, McDorman said.